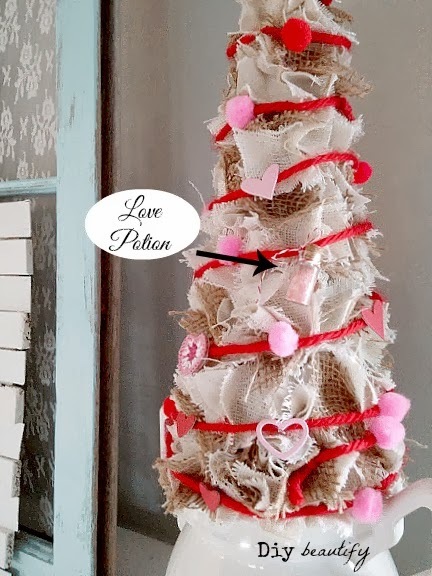 Deck the Tree with Hearts and Pom Poms! Do you recognize it? The tree? 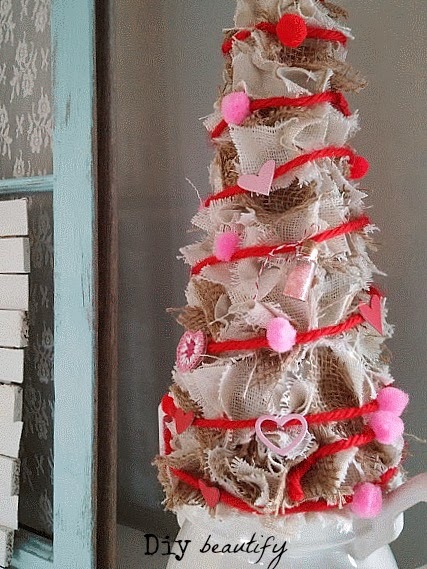 It's my burlap and drop cloth tree that I just couldn't bear to put away after Christmas because I love it so much! Seriously, have you ever seen anything so cute? I decorated the tree for Valentines!! I made the sweetest little garlands for this tree and my pleated drop cloth tree. And the best part? They were easy peasy! I took my red yarn and laid it out. And then I simply hot glued pink and red pom poms, chipboard hearts and tiny crocheted flowers to it. 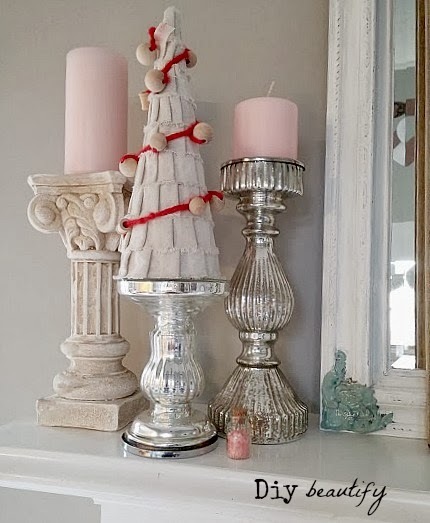 Once the glue had dried, I just lightly wrapped the garland around my tree. Did you spot the tiny vial of 'Love Potion'? I added one of those too! 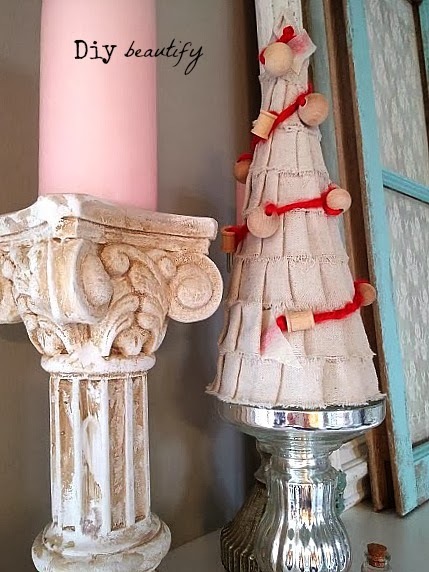 For my other tree, I just grabbed some wooden balls and spools, threaded them onto my yarn, and knotted them in place. All of these supplies can be found at any craft store. 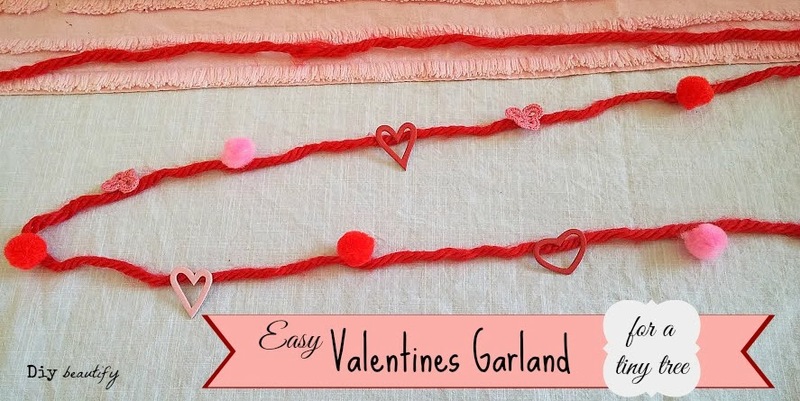 I happened to already have them in my stash, so it was a freebie craft for me :) Love those! The trees add a nice pop of color to my mantle for Valentines. 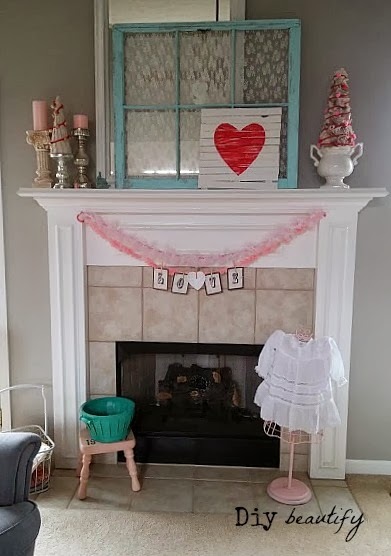 To see more of my Valentines crafts and tutorials, you can read about my vintage Love sign, find out how I made the mini pallet sign, how to make some adorable felt hearts, how to make the love potion, and those swags you see hanging on my mantle. I've been a busy girl! Love it-cupid is surely on his way! Haha, yes I believe so! The little trees look so cute all dressed up with LOVE! Thanks so much for sharing with SYC. Your comments are like sunshine and chocolate! Thanks for taking the time to leave a nice one ;) I read all comments and love to respond if you leave your email! Otherwise, please look for my response under the post where you left it! Copyright DIY beautify 2013. Powered by Blogger. 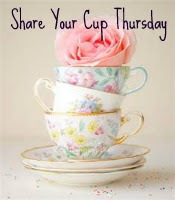 I love when you share! Just remember that all images and text on this site are property of DIY beautify. You are welcome to use one or two photos as long as a link back to my original post is included. Please do not remove any watermarks, crop or edit any of my images without first obtaining written permission from me. All free printables on my site are for personal use only, and not to be used to make money. Pinning is always welcome and appreciated. Please respect the effort I've put into my blog and I will do the same for you...Thank You! DIY beautify is a participant in the Amazon Services LLC Associates Program, an affiliate advertising program designed to provide a means for sites to earn advertising fees by advertising and linking to Amazon.com. This blog's content is for entertainment purposes only and is not professional advice. By reading this blog and attempting to recreate any content shared on it, you assume all responsibility for any injuries or damages incurred. Read my full disclaimer here.